Explore with us the fascinating newly discovered chambered tomb at Banks in South Ronadlsay. A stone age chambered tomb where the remains of at least eight people have been discovered. Also Tomb of the Eagles where 30 ancient human skulls and seventy talons from white tailed sea eagles were discovered. This day tour is an exciting trip for all. Explore these wonderful Tombs which give an insight into Stone Age life and death. 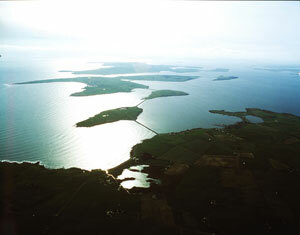 Leaving at 9am we drive to the south isles across the famous Churchill barriers where you can view Scapa Flow. Our first stop is the beautiful Italian Chapel where with minimal materials patience and faith produced this incredible place to worship. Arriving at Tomb of the Eagles we explore the visitor centre. Here you can see feel and touch real relics of ancient times and listen to the fantastic guides tell you about the tomb and its story. After this there is a walk to the tomb along the cliff top where the views are remarkable. You can access the tomb through a small entrance at the front. Moving on we drive a short distance to the newly discovered Banks Tomb. This is a Stone Age chambered tomb where the remains of at least 8 people have been discovered. 5000 years old with 5 cells branching of it from a T-shaped entrance. These ancient builders appear to have used a natural mound or ridge and have quarried out a large hole down into the rock and then constructed walls inside to form the 5 cells. You can explore the area and read all the information about the excavation from the visitor’s site. 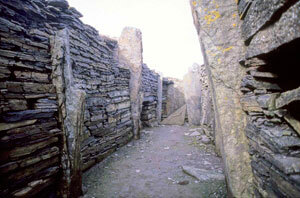 There are 3 stones with Neolithic writing and a camera is set up so you may view the inside of one of the chambers. You can also access the walkway across the tomb. This is a truly exciting new find and we feel privileged to take our visitors to explore this ancient site. This is a thought provoking tour covering fascinating facts, acts of faith, courage and patience. 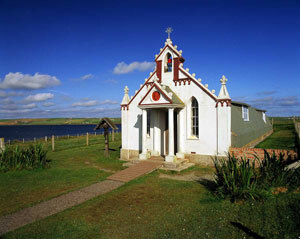 This tour start at 9 a.m. in Kirkwall and finishes in Kirkwall around 2 p.m.
Price for this tour is £50 per person.